When you are installing kitchen cabinets from a flatpack, unpack all the components and lay the parts around your kitchen wall in their carcass 'units', and also sort out the hardware required for each unit. The parts are clearly labeled and the supplied hardware sheet outlines the location of the hardware.There are many types of fasteners so collect the drill bits required as well. A good quality cordless clutch drill is essential. Use a table with a soft blanket on it to assemble the carcasses at a comfortable height. The assembly instructions will give a blow by blow on the steps so read them carefully. 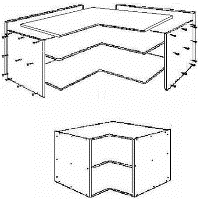 You are basically building a 4 sided box (no top or front) that has been pre-drilled. The secret here is getting each board to face the right way as rear edges have no pvc edging. Starting with a standard two door cabinet, lay the base board on the table and stand the rear board up behind it and line up the pre-drilled holes, and using the 50mm (2ins) screws, drive them in with a clutched cordless drill. Next add the sides, then the shelf, then the small false front board and you have your first carcass. Once you have done one the rest are easy. As long as the cabinet is on the table, you may as well install the legs. They are fully adjustable and need to be placed a certain distance back beyond the kicks so check your instructions. Extend the legs to a standard length on all cabinets for a base line when leveling. The hinge receivers can also be installed in the pre-drilled holes. Now assemble the rest of the carcasses and the pantry, which is a challenge unless you have a helper. Place the kitchen cabinets around the wall in position firstly check the square of the wall corners. You will see now why squaring the internal frames to the external ones was a good idea. If there is any variation, make up shims to help position the cabinets. Now determine the height at which you want the benchtop to be. Most are between 850mm and 1050mm with 900mm (36ins) being the standard. This will be pre-determined by the height of your kickboard (standard about 150mm/6ins) plus the height of the cabinet 720mm (28ins) plus the thickness of the benchtop. If the floor is uneven, find the lowest point and mark your levels from there. Your only option here is to shave the kicks back to fit. Don't worry, that's what the pros do as well. Mark a level line on the wall to set your carcasses against when installing. Secure the cabinets to the stud wall starting with corner cabinets, adjust the legs to achieve your level. Secure them together as well through the pre-drilled holes using the smaller screws. Keep checking your marked level. If you have high cabinets, it may be easier to install them first. Time to fit the benchtop to the kitchen cabinet carcasses. It comes in one or more pieces which are clamped together underneath. 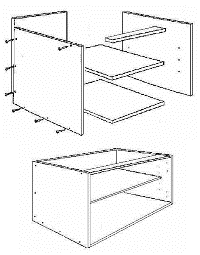 Set each piece on the cabinets and determine how they will be positioned. 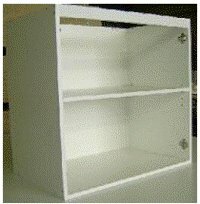 Lay a good bead of builders glue along the cabinet top edges and carefully set the top down. Move it around until it sits flush then wipe off excess glue. Repeat with extra benches, apply a clear silicon bead between them and clamp together as directed. Now: the next phase of installing kitchen cabinets is to fit the kick-boards. You will have to trim to fit. There will be supplied mechanisms to attach these so again read the instructions and all will be well. Set the hinges and handles onto the doors and snap them onto the hinge receivers previously installed in the cabinets. Adjust the hinges so the doors are straight and level. Now cover the screw heads with the caps and stickers and you are done. Installing kitchen cabinets from flat-packs is a great fit for kit home builders, especially small kitchens, so give it a go. It will only take about three days, and you will be ready to install the rest of the kitchen.